District Housing is a web application that makes it easier for residents and social workers to find and apply for affordable housing in the Washington DC area. 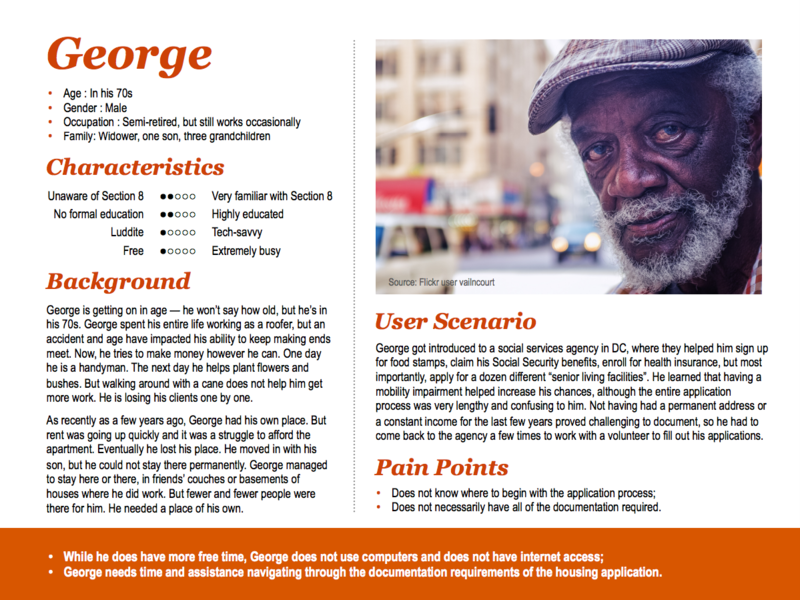 As the UX designer, I conducted user research and interviews with Section 8 applicants, built and tested prototypes, and worked with the Code for DC team and our local partner, Bread for the City to develop and implement the application. DC’s subsidized housing application system is utterly fragmented, lengthy, and inefficient. There are 100+ different buildings offering affordable units, each with its own application, and none of which are electronically accessible. Individuals and families in need of affordable housing must determine if they meet the varying eligibility criteria, and fill out personal information, repeatedly and by hand, for multiple applications. For this project, I was part of a group of Code for DC volunteers helping community partner Bread for the City, a social services agency, better serve its housing program clients. 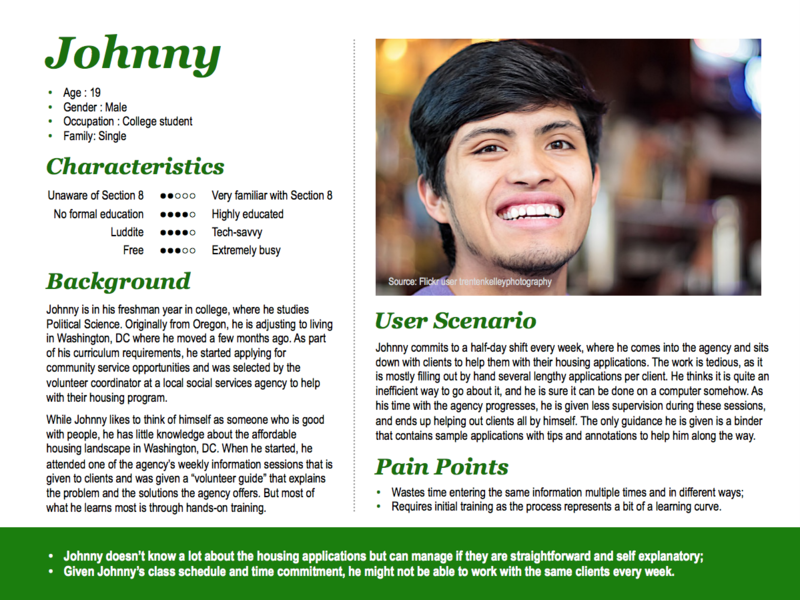 In the initial phase of the design research process, a big focus was put on understanding the current paper-based application process, especially by attending weekly “housing clinics” where social case workers and volunteers walk their clients through the affordable housing applications. Aside from Bread for the City case workers and applicants, I sought out to find and interview DC residents that have recently or are in the process of applying for an affordable housing unit, particularly ones that have gone through the entire process by themselves (i.e. without going through a social services agency), in order to understand how they became aware of the program, what their application process was like, and how they prepared for it. I conducted a comparative analysis of other tools (e.g. 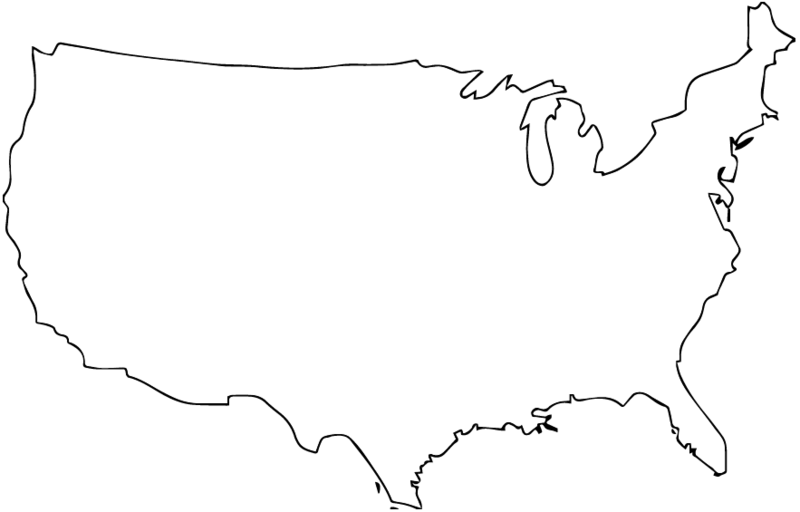 Gov.UK, Simple Bank, TurboTax, the Social Security Administration) that citizens use to learn about, prepare, and apply for a service, looking for inspiration, patterns,and best practices. 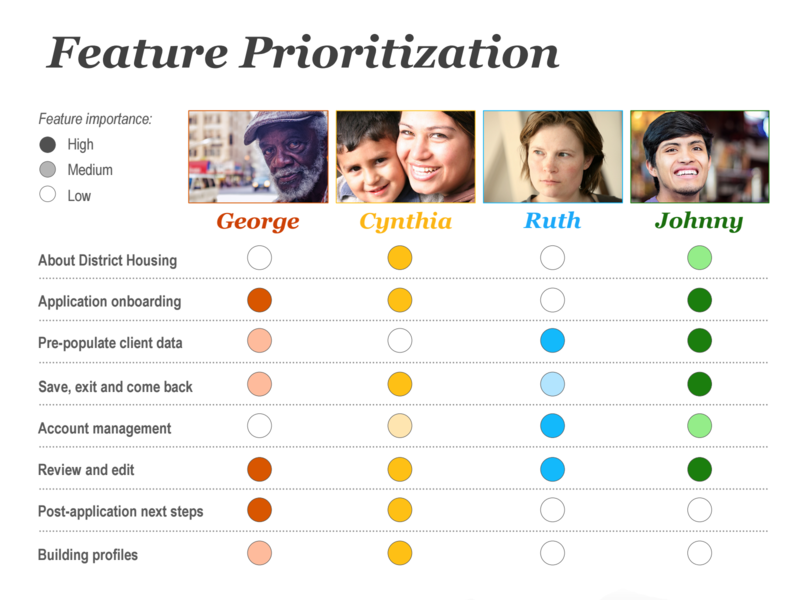 I developed four personas representing distinct user profiles based on their familiarity with DC’s affordable housing rules and requirements, their tech-savviness and time constraints. 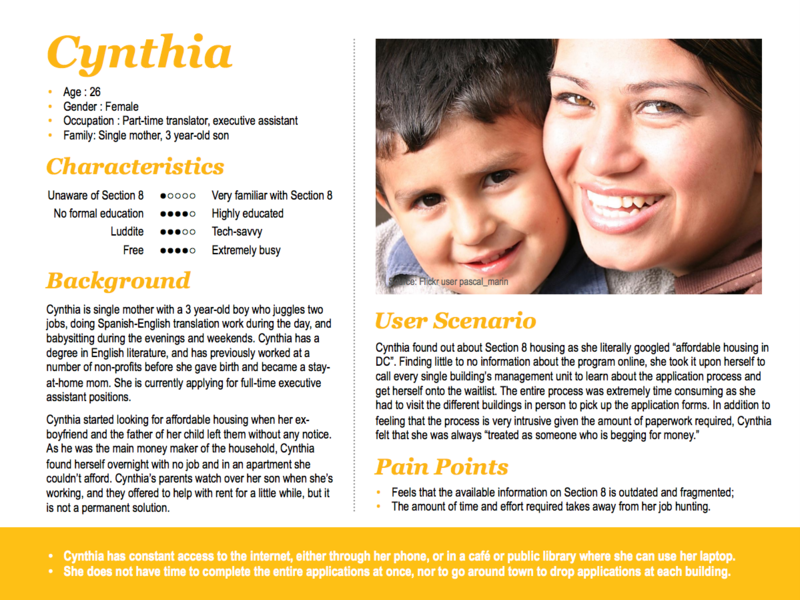 Two personas represented applicants (one who would go through the process by themselves, the other with the help of a case worker), and two represented “helpers” (an experienced social worker and sporadic volunteer). 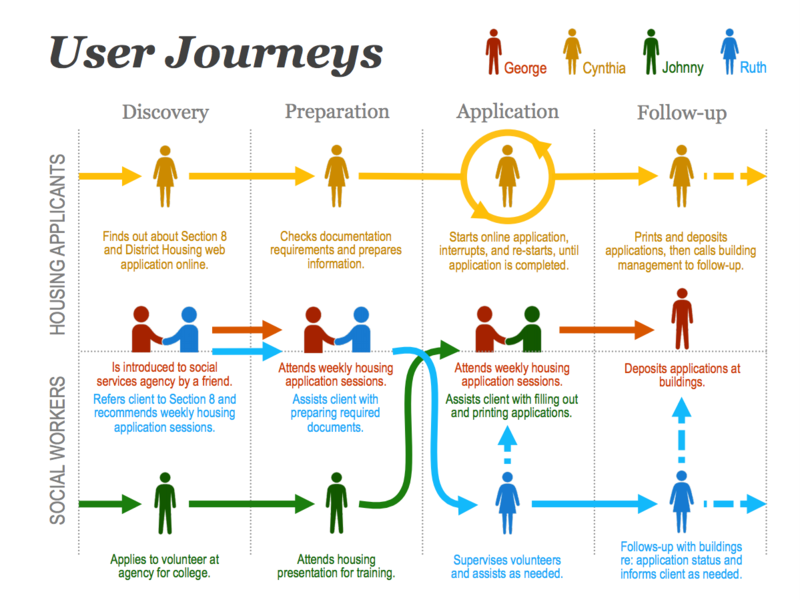 Journeys were created to represent their experience from the moment they find out about the program until they submit their application and await the result. 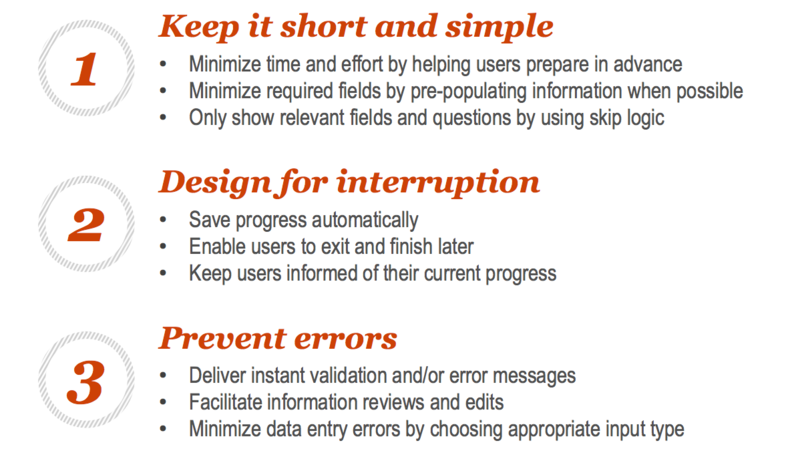 I developed three design principles grounded in my synthesis, to inform and evaluate all ideas moving forward. For instance, I noticed that housing clinics had many repeat visitors since it took too long for anyone to finish their application in one go, hence the need to allow for interruption. I analyzed all of the questions in all 100+ applications to determine patterns, duplicates, and questions phrased differently that could be answered by the same prompt (e.g. “Date of Birth”, “Age”, and “Are you 65 or older?” can all be answered by entering the date of birth of the applicant). I also needed to determine the minimum viable form fields that would, combined, allow applicants to fill out the maximum number of fields, with a few outlier questions that can be filled out later individually to avoid initial information overload. I also tried to leverage Bread for the City’s “tricks of the trade” that they have collected in a binder through the years, including notes on the most common mistakes that render applications ineligible, in order to make the questions phrasing/labels more self-explanatory, or to add helpful tips and onboarding instructions for prospective applicants. 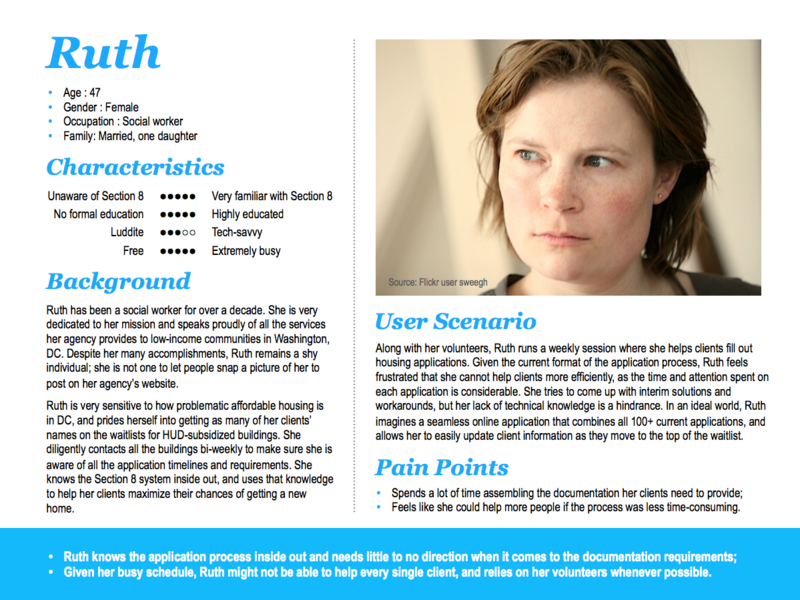 I decided on a web application concept that uses the applicant’s data to automatically determine their eligibility to different buildings and fill out the corresponding applications, I sketched out ideas for what the structure and main information architecture of the app would be, before using existing form builders to prototype a more testable version. I conducted two rounds of usability testing. Following each round, changes were made based on testing results, while new functionality was added (e.g. “save and finish later” feature). My team worked to develop the web app based on the latest version of the prototype. Bread for the City was keen to try out the app as soon as possible, so I prioritized the minimum feature-set needed in order to allow case workers to test the solution in their housing clinics and give us feedback. Based on that, we continued iterating on the app while developing new features gradually. In order to work around the strict application formats imposed by each building, we designed a solution that would “print” information on top of a PDF, which required individually tagging each field of said PDF based on a naming convention we created. 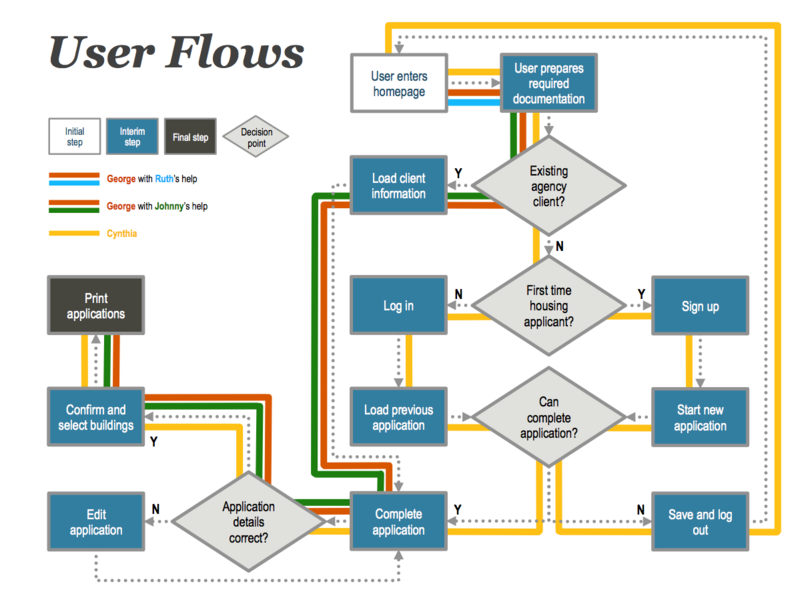 This process was extremely time-consuming, and prompted us to start conversations with the Department of Housing and Urban Development (HUD) to standardize the application process altogether. In the meantime, other agencies willing to use the web app can find the code on our GitHub repository. My blog post describing the research behind the product: "What we're making: District Housing."